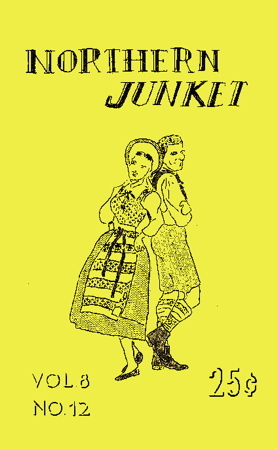 Northern Junket was edited and published by Ralph Page from April 1949 to July 1984. The magazine was a labor of love for Ralph. He single-handedly produced a total of 165 issues in fourteen volumes, doing everything from editing the copy to affixing the stamps and carrying the finished, mimeographed copies to the post office. Far-reaching in scope, each issue contains a forthright editorial, directions and tunes for squares, contras, and folk dances as well as folk songs, recipes, riddles, tongue-twisters, old wives' tales, and other folklife traditions.